There are many slow cooker recipes available, but when you will have some food for which you do not have a slow cooker recipe, you can still cook it in the slow cooker by using some basic slow cooking guidelines and cooking times for slow cooking. You can also use traditional recipes and adapt them to be used as slow cooker recipes. The cooking times will vary according to the type of food, amount of food being cooked, the size of pieces, and the type of other ingredients cooked with the food. The information below contains tips and advice on how to adapt traditional recipes and cooking times, along with other slow cooking tips. Many different types of food and recipes can be cooked in a slow cooker. There are some cooking basics that should be followed for successful slow cooking. The basic information below should be followed most often when slow cooking but always follow special instructions included in the slow cooking recipe. Most slow cookers should be preheated before placing the ingredients in it but check the user's manual first because some models heat up quickly and do not require preheating. 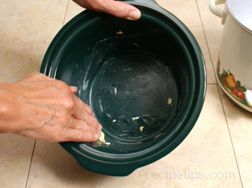 To preheat, place the empty crock in the heating unit and place the cover on the crock. Turn the unit on high and preheat for the suggested time in the user's manual. If you do not have a manual, preheat for 15 to 20 minutes. Fill the crock at least half but no more than two-thirds full for the most efficient cooking. Do not lift the lid during the cooking time unless it is specifically stated to do so in the recipe. Each time the lid is lifted, heat escapes from the slow cooker and 20 minutes will need to be added to the cooking time to make up for the heat loss. 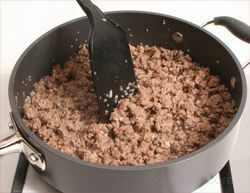 If the recipe instructs to stir the ingredients any time during the cooking period, stir and replace the cover as quickly as possible. If timing does not allow the recipe to be cooked on low for as long as required, the slow cooker can be turned up to high and the cooking time reduced. Convert cooking time by using a ratio of 2 hours of cooking on low as being equal to 1 hour of cooking on high. 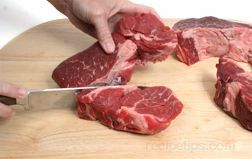 Note: it is best to cook the less tender cuts of meat on low for a long period of time to produce a more tender cut when it is done. Seasonings have a tendency to loose their strength during the long cooking process so it is best to taste test the food at the end of the cooking time and add more if necessary. Or, the seasoning can be added towards the end of the cooking time instead. 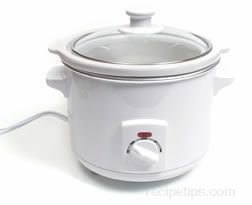 If possible, turn the slow cooker on high to start the cooking process and then switch to low after an hour. 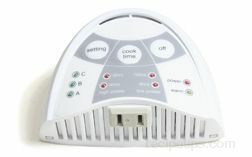 This will reduce the amount of time required to cook the food thoroughly. Some models can be set to automatically make this switch. When checking for doneness, the best manner in which to ensure that the food has been cooked properly is to check it with a thermometer. 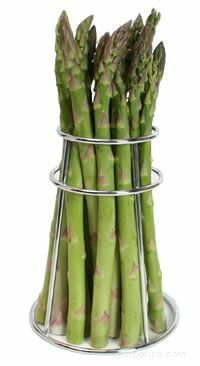 To be considered thoroughly cooked, the food should reach 160°F. Most slow cooker recipes will give a range of cooking time because each slow cooker may cook slower or faster than another. It will just take using yours and getting use to how it cooks to figure out where your cooker will fall in the range of cooking time. Before using your slow cooker for the first time, read the user's manual for special instructions. Each model may have slightly different instructions. The chart below provides some basic cooking times for some general types of food that can be cooked in a slow cooker. Because different models of slow cookers cook at slightly different temperatures, the cooking times below are given in a range. If a slow cooker cooks at a slightly higher temperature, it will require a cooking time on the lower end of the range and if it cooks at a slightly lower temperature, it will require a cooking time on the higher end of the range. Start checking for doneness at the low end of the time range when you are first using the slow cooker. After using the slow cooker a few times, you will be able to determine where in the cooking range you should be. Note: The times above are estimated times only. 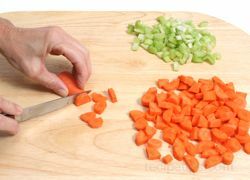 The cooking times will vary according to the amount of food being cooked, the size of pieces, and the type of other ingredients cooked with the food. If using a slow cooking recipe, be sure to follow the cooking times suggested in the recipe. See the recipe sections below for examples of some the different typed of food and dishes that can be prepared in a slow cooker. Each section includes detailed instructions on how to prepare the different types of foods in the slow cooker. Most traditional recipes can be converted to use as slow cooker recipes. There are some simple guidelines that can be followed to assist in successfully converting some of your favorite recipes. See the guidelines below. Select recipes that typically require 45 minutes or more of cooking time. This is an indication that the ingredients should hold up through the long cooking times used for slow cooking. Reduce the amount of liquid the recipe calls for by about half. The slow cooking process will produce more liquid during the cooking process and liquid does not boil away with the slow cooking method. If the recipe does not include any liquid or sauce of any kind, you should add 1/2 cup of water to the slow cooker because the moisture is needed to produce steam for the slow cooker to reach the appropriate cooking temperatures. To avoid rice and pasta from becoming sticky, cook them on the stovetop and add in at the end of the cooking time just long enough for them to be heated thoroughly with the other ingredients. If you want to cook them in the slow cooker, wait until the last 60 to 90 minutes of cooking time to add rice and add pasta in the last 15 to 30 minutes. Be sure to add an extra 1/2 cup of water for every 1/2 cup of rice that is added. If at the end of the cooking time you have more liquid than wanted for the dish, drain it into a saucepan and simmer on the stovetop to reduce. Season if necessary and add it back in the slow cooker with the other ingredients. Follow the same guidelines used for slow cooking recipes. When cooking with a slow-cooker, the cooking times will need to be lengthened in comparison to the cooking times for traditional recipes. Be sure to allow enough time for food to be cooked to proper doneness. Most uncooked meat/poultry and vegetable combinations will require at least 8 hours on low. Do not use the slow cooker for reheating leftovers. Heat the leftovers to a safe temperature in the microwave, on the stove, or in the oven and then transfer to a slow cooker to keep it warm. Cooking for 1 hour on high is equal to 2 hours on low when slow cooking. When cooking at high altitudes, be sure to increase cooking times. Increase approximately an additional 30 minutes per 1 hour of suggested cooking time. Slow cooking tough cuts of meat on low will provide the most tender results. Do not lift the lid while the slow cooker is cooking unless instructed by the recipe. Every time the lid is lifted the cooking time should be increased by 20 minutes. 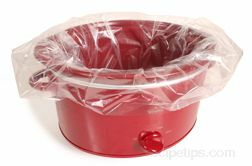 Twisting the lid around, while leaving it on the crock will make the condensation fall off making it easier to see through the cover. 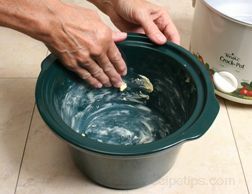 If not using a slow cooker liner, butter, grease, or use cooking oil spray on the inside of the crock for easier cleanup. 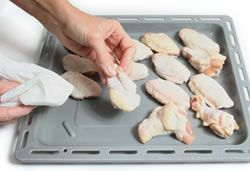 To reduce the amount of fat in a meat dish, remove any excess fat and remove the skin from poultry. To prevent fish and seafood from becoming tough, add them to the dish during the hour of slow cooking time. Do not cook frozen meat in the slow cooker because it will take too long for its internal temperature to reach 140°F. The meat could be in the danger zone between 40°F and 140°F for too long and this would allow bacteria more of a chance to grow, possibly causing the meat to be unsafe to eat. Placing aluminum foil over the content of the slow cooker or placing it over the top of the crock with the cover placed on top of the foil will speed up the cooking process. Heat that would normally be lost through the cover is reflected back to the food being cooked. "I'm remodeling my kitchen and am tired of eating out. So... Here I go diving head first into the slow cooker arena with no idea of the do's and do's nots. ;) This article answered all my questions that I have been searching for. Straight and to the point. Thank you! I feel much more prepared to succeed!"